On my recent trip to London, we had a lovely walk on Southbank and decided to stop at Wahaca for some lunch. This was my first ever trip to Mexican street-food chain, Wahaca and it did not disappoint. 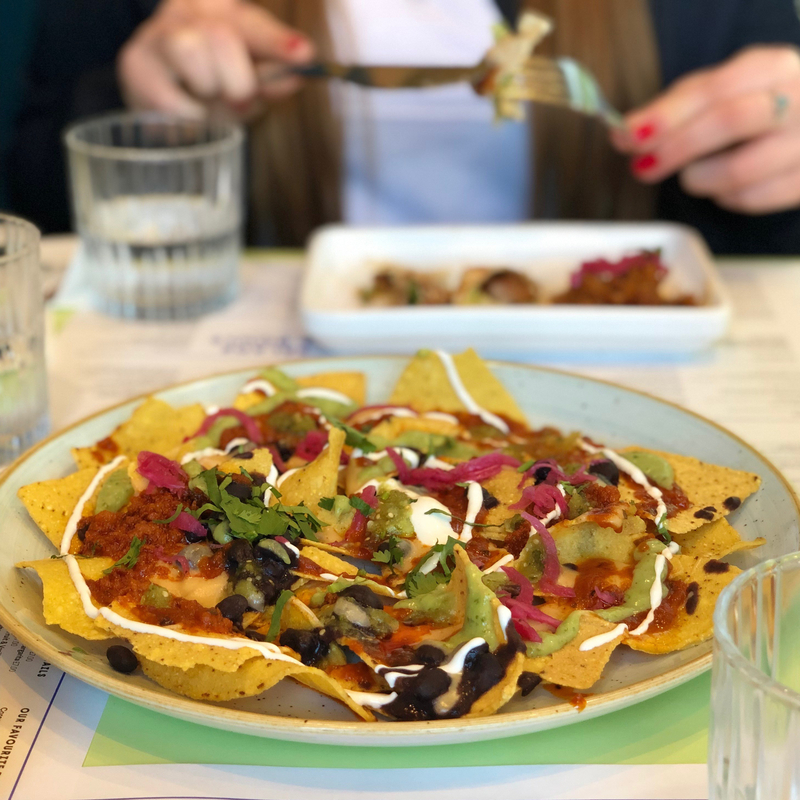 Wahaca was founded by 2005 Masterchef winner, Thomasina Miers who teamed up with her husband, Mark, to create Wahacas menu. They combine healthy eating with hearty eating, packing an abundance of flavour into every dish. We decided to order from the tapas section of their menu, as we just wanted something light to share. Firstly we opted for the Mexican city nachos with chorizo, cheese sauce, tomatillo and avocado. As you can tell from the pictures below these were covered in chorizo and sauces and also had a slight kick. The only criticism I do have, is that there was nowhere near enough cheese. Nachos should be oozing in tasty cheese and these deffo weren’t. We also got the grilled chicken club quesadilla with avocado, lettuce, melted cheese and chipotle mayo. As well as, the chargrilled steak Bajo Tacos with avocado and chipotle sauce. These were both great, tasty dishes, which I would happily have again. The girls I was with raved about the pork pibil tacos, slow cooked in citrus and spices with pink pickled onions. So we had to get them and these were easily the best dish we had. Packed full of pulled pork, which was tender, melted in the mouth and had an abundance of spice and flavour. Wahaca is a lovely chain restaurant, packed full of healthy, hearty meals perfect for any time of day, all washed down with a tequila or two. If you are ever near one make sure to call in. I hope you enjoyed reading about my trip to Wahaca in London. Watch out for more foodie reviews.